FDA Warns About Fluoroquinolone Antibiotic Dangers | Hupy and Abraham, S.C.
Have You Been Hurt by Your Antibiotic Medication? The agency found that the potential of serious harm outweighed the benefit in less significant bacterial infections such as bronchitis, urinary tract infections, and sinusitis. 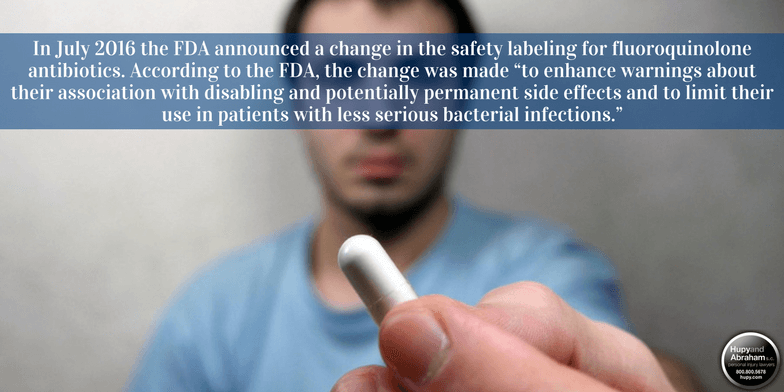 However, the FDA did not pull these medications from the market and continues to approve their use for more serious infections such as plague, anthrax, and pneumonia. Any of these drugs can result in serious side effects. Permanent disability or death can result from many of these injuries. Lawsuits have been filed against the drug manufacturers who designed and produced fluoroquinolone antibiotics. These lawsuits typically allege that the manufacturers made a defective product and that the plaintiffs were hurt or their loved ones were killed as a result. A lawsuit filed in 2016 also alleged that Johnson & Johnson’s Janssen unit intentionally downplayed known side effects. If you have been hurt by a fluoroquinolone antibiotic, or any other specific medication, then your time to file a lawsuit is limited by the statute of limitations. Accordingly, we encourage you to contact an experienced pharmaceutical class action lawyer today at 1-800-800-5678 to learn more and to set up a free consultation.